We’re joined this week by Surf Simply’s cameo coach, Sam Wakerley, who’s joining us on his vacation from work as a Business and Economics teacher in Abu Dhabi. 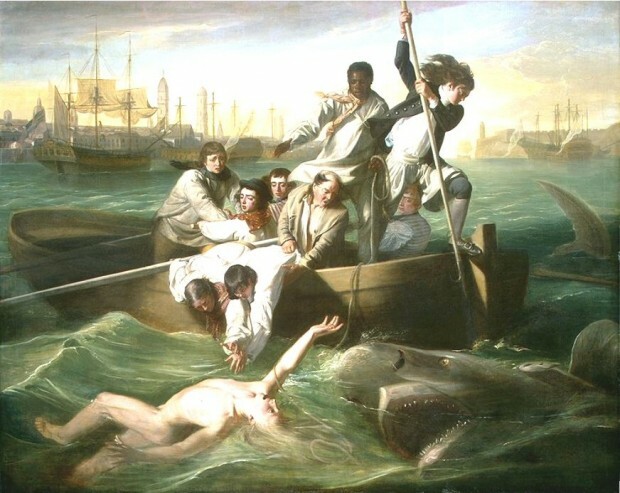 Ru mentioned a study where smart phones where used to diagnose depression, and Harry brought up the podcast being featured on The Inertia, and that lead to a discussion about how long sharks have been demonised, in which Harry mentioned old paintings of shark attacks, like this one by John Singleton Copley from 1778. First up in the News this week was the footage from Surf Snowdonia that was released last week and looks super cool. Ru passed our best wishes onto our friend Graham Swindell who was injured last week. Get well soon Graham. We then went on to talk about the interview with Chris Malloy that we featured on our Magazine, and the finishing of the REDirect film making contest which was won by Aaron Lieber with his film The Wild. Harry brought up the story of a Mackrel attacking a surfer in Brazil, before moving on to talk about the Surfer Magazine article about shark attack statistics. Ru then mentioned some research he’d done for Episode 17 on the same subject. First up was the US Open of Surf at Huntington Beach in California, which was won by Hiroto Ohhara in the men’s division and Johanne Defay in the Women’s. We mentioned Hiroto Ohhara’s acceptance speech, but I’m afraid I couldn’t find a video of that to post here. We then moved on to talk about the Billabong Pro Tahiti. Ru brought up Shea Lopez’s fantasy surfer picks, and Harry brought up Ross Williams’ picks on the WSL. Ru then mentioned the drone footage of Teahupo’o from the last big swell. We gave a quick run down of the Fantasy League status, with “Austin’s Picks” winning J-Bay, and “Paul’s Claiming It” leading the men’s club, while in the women’s, “Julio’s Picks” won the US Open but “Coryn” still leading the field. If you want to play along with us, join our club on the WSL Fantasy Surfer League. Ru gave us a little rundown of some ways to stay surf fit when you’re away from the ocean. A lot of the information came from this excellent article on lower back pain which is taken from the Science Based Medicine site. Sam mentioned the Surf Fitness video with Taylor Knox, and Harry and Sam both gave a big recommendation to Carver Skateboards. Harry also brought up the Nike video showing Nat Young’s training while he’s at home in Santa Cruz. Ru also mentioned 2 yoga poses that might be helpful. Cat & Camel on the left, and Bridge Pose on the right. 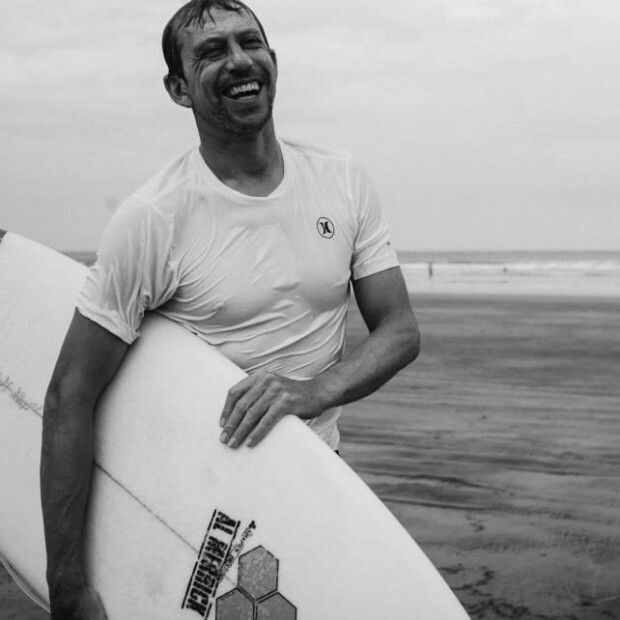 Our Superhero of Surf this episode is South African shaper, Peter Daniels, who sadly died earlier this week. As well as shaping for such notable surfers as Jeff Hackman, Martin Potter, Tom Curren, Kelly Slater, Sunny Garcia, Adriano de Souza and Jordy Smith, he also unknowingly shaped Harry’s first surfboard. Peter was born in Durban, South Africa in 1949, and started surfing in 1964. A talented surfer, he became a standout at J-Bay and in 1976 was the first South African to get a cover shot on Surfer Magazine. He started shaping at 19 and quickly developed a good reputation. He travelled regularly to Japan, Brazil and America to shape, and lived in Hawaii for several years, before joining the Spanish shaping collab, Pukas in 1993. He was a fan of high performance contest surfing, and shaped boards for a lot of the World Tour elite over his 50 year career, including working with Kelly Slater to develop some interesting bottom contour combinations. Ru started us off by recommending the book “Barbarian Days: A surfing Life” by William Finnegan as a good read, which also caused us to mention “Tapping the Source” by Kem Nunn. We then moved on to talk about Robbie Maddison riding a dirt bike at Teahupoó.